Melissa Productions CEO, Melissa Perry Moraja, redesigns the company’s website in order to create a world for her children’s book characters. The new website provides a fun interactive experience in a user-friendly, child safe environment. Creating an interactive child-friendly experience for children on the web encourages them to learn! Melissa Perry Moraja, CEO of Melissa Productions, revamps her self-publishing children’s book website to increase user-friendliness and functionality, while creating a fun, interactive experience for children and parents. The changes stem from Melissa’s desire to provide an opportunity for her audience to experience the richness of each character she has created in an entertaining and educational environment. As a mother of four, ranging in age from one to ten years of age, the website, just like her stories, was developed based on what her children would enjoy, interact with and learn from. The new website can be found at http://www.melissaproductions.com. Melissa Perry Moraja doesn’t plan on stopping there. Later this fall, her company plans to develop and launch an interactive 2D world for her second children’s book series—The Wunderkind Family, sharing their extraordinary humorous family adventures through real-life lessons. Over the next year, the company plans on adding story-based animations and interactive educational games. Melissa Perry Moraja is an entrepreneurial mom, a multifaceted business woman and a creative producer, authoring and illustrating numerous children’s stories and self-help books. 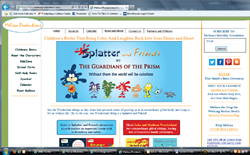 Founded in 2009, Melissa Production’s mission is to offer humorous, inspirational products and services that promote self-awareness, creative learning, and leadership with the family in mind.With popular story book characters like Splatter; she speaks to children’s hearts through color and parents thoughts by providing educational stories. For more information, please visit http://www.melissaproductions.com.